This engine is specifically designed for the discerning 300 cid (5 litre) owner who needs to replace or is looking to upgrade his basic crate engine(s) for something more sophisticated. If you are looking for a faster, more reliable engine that will put that little extra sparkle back into your boats performance but at the same time improve fuel consumption, then this is the engine for you. Whilst at first glance the improvement in BHP may seem modest compared to its standard factory counterpart, it should be borne in mind that this improvement in BHP, and crucially torque, is in both cases at several hundred RPM lower down the rev range. These carefully considered engineering improvements give the driving impression of a considerably faster boat but without the usual fuel penalties associated with more power. 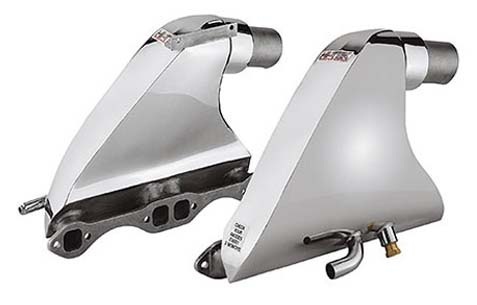 Suitable for Mercruiser's equipped with Alpha or Bravo legs. Can be used with Volvo Penta drive legs. Depending on boat, in order to prevent over-revving, and feel the full effect of its extra torque, this engine will probably need to carry a larger diameter or coarser pitch propeller. Stage 1 - Specially developed marine camshaft - delivering more torque at lower rpm. Light reshaping of combustion chambers in cylinder heads - To improve gas flow and increase torque.